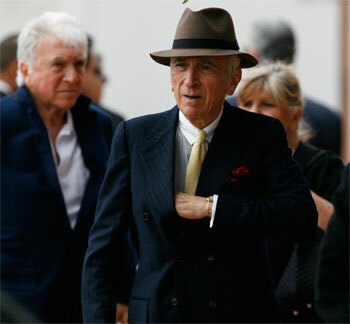 Gay Talese was getting ready to pack when a telephone call interrupted him. His longtime friend, the mobster Salvatore “Bill” Bonanno, had just died of a heart attack in Tucson on Jan. 1. He needed to pack; his flight would be leaving New York soon. So he didn’t have time to talk to me, a student reporter. Even as I begged him to give me a few minutes for an interview, the sound of another telephone could be heard ringing in the background. He talked; I listened. And then he hung up the phone before I could tell him that I would be at the funeral, too. The next time I saw him, he was leaving SS. Peter and Paul Roman Catholic Church. He wore a blue pinstriped suit, a crimson-red handkerchief and a fedora. I walked up to him to introduce myself, but it took me a few seconds to get his attention because he was chatting with another man. He remembered me, but said he didn’t have time to talk. So he shouted, “Call me at the Sheraton in Tucson,” then disappeared into a car. But there was no time to call him because The New York Times called me. They wanted Bonanno’s story to run in the paper. Tomorrow. My story. In The New York Times. I felt so good after writing. It was unbelievable. I was going to have a byline in The Times. Foolishly, I thought Talese would be willing to talk, so I searched for his hotel. The good news: there were only two Sheratons in Tucson. The bad news: the phone would never ring when I called him at his hotel with the tape recorder on. It took almost an hour before I finally got through, and Talese remained the elusive interview. “I have to go in five minutes. Can we talk tomorrow?” he asked. Apparently, third time wasn’t the charm with him.The next day was different, but not in the way I could have expected. “I don’t collaborate,” he said. I thanked him for pointing out the mistake and for reading the article. I understood where he was coming from; good journalists think for themselves and are responsible for their own work. And then came the most surprising thing of the entire week: he complimented me. He had liked the details in my story, especially the quotes included from Bonanno’s children that no other newspaper got. It felt as if he’d recognized me as a journalist. And finally, after I had chased this man for a week, he said the magic words: Ask me anything you want. One great piece of advice to all writers in general: use your imagination. This is particularly important if you are wet behind the ears and covering a new beat. Sounds simple enough, right? Writing is one of those creative professions. You know, the ones where you are free to express yourself, explore your feelings, and be really … deep. But wait. I’m putting the cart before the horse. In one of our introductory sessions on interviewing techniques, Russell Contreras, reporter and Web editor for The Boston Globe, gave us some advice that had an enormous impact on me. In fact, in terms of journalistic advice, I thought it was the best thing since sliced bread. And believe me, we eat a lot of sliced bread at this institute. Russ: You know when you’re interviewing someone, particularly for a disaster story, and you ask him to describe the scene and they say, “It looked like a war zone”? Say, “Oh, really. Have you ever been to a war zone”? And if they haven’t, what they say next to explain what they meant, or to describe it in other words, is where you get your best quote. If they say yes, ask them to tell you about it. Again, you get a better description and a better quote. A light bulb went off in our heads. And I’ve been eliminating clichés from my vocabulary and stories every since. His basic point was to stop being lazy. It’s a lot easier to describe something using common expressions or overly used phrases than it is to actually use your vocabulary and come up with something original. So, on to the business at hand. How do you improve your writing and use your words more effectively? But remember, this is journalism — it’s a craft, not an exact science. So sometimes (very rarely) you may have to break the rules. After all, some things are cliché for a reason. Orwell’s essay is actually a really good one and will undoubtedly improve your writing. Maybe not immediately, but Rome wasn’t built in a day. Take my advice. I guarantee it’s as good as gold. Never has an article I’ve written caused me to look deep within myself and ask if I am in a similar situation. With a story I recently worked on, the answer was yes, I am. The article was about integration: mixing the Latino immigrant culture together with the American one to create Hispanics. There was an amazing family of three generations I got to interview: a grandmother, a mother and father, and four children. The interview was done in the home of the mother and father, Carlos and Angelica Alvarez. Each generation in that small apartment in South Tucson had a shift toward Americanization of its own, and yet, the family unity remains. The four Alvarez children — Carlos Jr., 16; Esgar, 12; Emanuel, 9; and Israel, 3 — all sat quietly on the couch and listened as their parents and grandmother answered my questions, and occasionally answered some themselves. The grandmother, Marta, is the reason they’re all here. Her grandchildren may not realize the bravery it took for them to be born here. She is the true pioneer. At 47 years old, just 12 years ago, she bravely went through “el hoyo,” or “the hole,” which was cut in a border fence that she and thousands of others went through to reach the United States. She quickly found work as a janitor. She brought her three youngest children with her. Just six months ago, Marta got her citizenship. How happy she is. Now, all except two of her eight children live in the Tucson area. All are U.S. citizens. All of Marta’s 21 grandchildren are the first ones to speak English. They are the first to have lived the American experience from their youth. They are adapting to American culture, watching the same movies, listening to the same music and saying the same phrases as their peers. They are getting a good education. They will be bilingual, with a higher chance of getting a successful job and of having their own kids be English speakers. Other Hispanics in Tucson of my generation have gone through a similar type of integration. And so have I. In my immediate family, we don’t speak to each other in Spanish at home, but I do with my grandparents, who are Mexican immigrants. Luckily, I am fluent enough, but I do have to think sometimes to find the right words. Playing La Lotería, or the Mexican Bingo game, is still a fun family tradition. So is eating the Día de Los Reyes cake. My sister got the piece of cake with the baby Chist, so they will have to throw a party. Mariachi music is at every family wedding, tamales are served at Christmas, menudo is eaten on New Year’s. Each Sunday, we visit both sets of grandparents. In my life, Mexican traditions are still pretty strong. Like some of the people I interviewed, such as Maya Bernal, 17, and April Thompson, 24, I have within me a mixture of Mexican and American cultural characteristics. Maya realizes there is room for improvement in her limited Spanish skills. She can understand the language well, but she struggles to speak it. Still, she maintains strong relationships within her family. April, whose first language was Spanish because she grew up living with monolingual immigrant grandparents, has kept the Latino heritage alive within herself. With my own personal background — I’m first generation on my mother’s side — this article has taught me to embrace what is left of my Hispanic culture. I have to take what I have and make it stronger, otherwise it will fade, and I won’t know who I am anymore. Being Mexican-American reminds me where I come from. I must never forget that. Saturday was an interesting day for a girl whose interviews usually take place in nice offices or at gritty crime scenes. I spent the day on a ranch, surrounded by horses and their (über-rich) owners. I’d expected to find a bunch of snobs, but what I found instead was a group of interesting people. My first interview was literally dizzying. The woman talking to me was also walking her unsteady horse in circles, around me. In a feeble attempt to keep eye contact, I followed her lead until I’d spun enough to almost throw up. Next came a series of horseback riders and competitors. They were all so nice that I was able to forget about the awesome smell of horse dung. As cynical as I am (and yes, Russell, I do still question my mother when she tells me she loves me), I found everyone’s kindness to be some sort of deviation of sincerity. And I liked it. One woman I met had won an international horse competition more than a dozen times, yet she stood there and answered questions about horse stuff for 10 minutes. A couple of women and their tightly-lassoed husbands told me to go talk to their local celebrity, Don Imus’ brother. They said he was really nice. That’s not quite the word I’d choose. When I first approached Fred, he uttered something like, “What do you want?” I told him I was with The New York Times Student Journalism Institute and he said: “I hate The New York Times. Do they even have journalists there?” I replied with a laugh. I said I had just a few questions, and he said he’d answer only one. I rolled my eyes and smiled at him, subtly demanding he stop being such a geezer. So he agreed to answer more than one question, although he said he would stop talking to me as soon as I began to irritate him. The first thing I asked was, “What do you do for a living?” He looked at me and rolled his eyes, as if saying, “Oh, come on.” So I laughed and asked again: “What do you do for a living?” I mean, really, who knew Don Imus even had a brother? He went on to tell me about his once-weekly radio show on Sirius, which he emphasized was the greatest job he’d ever had. As he spoke to me I wondered what his brother would think about his little bro talking to a woman of color. Who works for a living. In a job other than domestic work. But, I erased Don’s face and went on with Fred. I wrapped up my interview after I got the quote I wanted (which I didn’t end up using anyway). I thanked him for his time, and he said I’d done a good job. “I don’t have time to talk,” said Gay Talese, the only person I was scheduled to interview yesterday for my story about the mafioso Salvatore “Bill” Bonanno, who died of a heart attack this past Tuesday. It was the last thing I was prepared to hear. Talese had rushed me off the phone when I first called to schedule the interview, and I had spent the interim time preparing, in part by skimming through his book “Honor Thy Father,” which chronicled the rise and fall of the Bonanno family. So when I heard those words, after almost two days of research, I did the only thing I could do to save my story: I begged. I pleaded with him to stay on the phone and told him it would take just five minutes, or really, any amount of time he could give me. I would have offered to wash his car if I thought it would have persuaded him. “You know I wrote a book about this, right?” he asked. He sounded so irritated. I was terrified that he was going to hang up on me, but I forced myself to ask him again for just a few minutes of his time. There was no way I was returning to the newsroom without a quote from him. It lasted five minutes, but it was all I needed. After I told Talese that I had read his book, he gave me some great insight about who Bonanno was. I was still rattled after the interview was over, but it felt good, as if I’d completed a rite of passage. I even got some compliments from the pros at The New York Times. Preparation was key. I had prepared for two days for two questions, but it didn’t matter. I had asked the right ones, and I got my story. Diego Ribadeneira, an assistant metropolitan editor at The New York Times. 1) “Be careful.” He said the questions should be clear and the reporter’s notes clean. 2) “Be prepared.” Journalists should do their research and know whom they are interviewing. That means using the Web as a resource to learn about the person and looking at archives for previous stories on the subject. Don’t put on a front, he said, because most people can see through the face. So be genuine.Failing at those points can have devastating consequences, said Diego Ribadeneira, an assistant metropolitan editor at The New York Times. He recalled the story of a woman who said she was a victim of Hurricane Katrina. After fleeing New Orleans, she claimed she had been stranded in a New York City hotel, and The Times related her story in a profile of her. But it wasn’t true. Ribadeneira said that after the story ran, the paper learned she had not been a victim of the storm. She was, in fact, being investigated by the district attorney and other law enforcement, suspected of stealing from the government, and The Times had to run a corrective story. Ribadeneira emphasized that it’s important to do background research, especially if it’s a mostly flattering profile. It’s embarrassing for a news organization to print a piece in praise of a person, he said, only to discover that the person has a rather unsavory background. You are currently browsing the archives for the Interviewing Techniques category.